ManagementFraud investigation, prevention, and detection, dispute processing, consumer verification, lost / stolen / suspended card services, dispute resolution, creditor mediation, status management, verification services. Trust us to protect your customers. 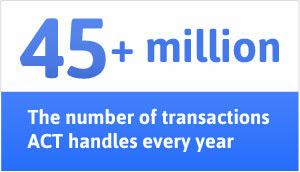 ACT has over 15 years of protecting customers from fraud related activities. ACT can help you mitigate and manage risk through account / identity verification, fraud investigation, and dispute mediation services. Our agents’ objective is to compassionately listen and confidently help the customer resolve their issues, while efficiently working to protect the interests of your business. Billing discrepancies can be a source of frustration for your customers. ACT agents are thoroughly trained in techniques to defuse the case and efficiently resolve the matter. More than just retaining the customer, you can leverage the situation to reinforce their trust and strengthen your relationship with them. Every business wants to increase their customer base—but it’s vitally important to the stability of your company to know who those customers actually are. Mitigate fraud and stay compliant with regulations by having ACT verify the identity of your consumers. Customer protection and the ability to provide secure services can be tantamount to your overall brand and reputation. ACT agents are able to securely handle card service cases such as a lost or stolen card, taking thorough measures to verify the identity of the caller and accurately process the request. Quickly and accurately work through the dispute process and keep customers informed and happy. Our mediation agents work quickly to identify the root cause of the dispute and efficiently move the situation towards a satisfactory resolution for all parties involved. Customers always want to know the status of their claim during a dispute and can become rapidly frustrated in the absence of one. Avoid that scenario entirely by having ACT provide status updates to inbound callers. Customers who lose confidence in your ability to protect them from fraud, find elsewhere to do business. Give them the benefit of ACT’s experience managing your programs. ACT has the experience to help identify and stop fraud. Customers with suspect transactions speak to knowledgeable representatives that confidently guide them to quick resolution. Protect customers at the point of sale while efficiently and unobtrusively getting them on their way with peace of mind. ACT starts with a recruiting process that attracts the best candidates. Continuing education, the right culture and experienced leadership give them the extra edge when creating great customer experiences. Save time and resources by utilizing ACT for your back office needs.